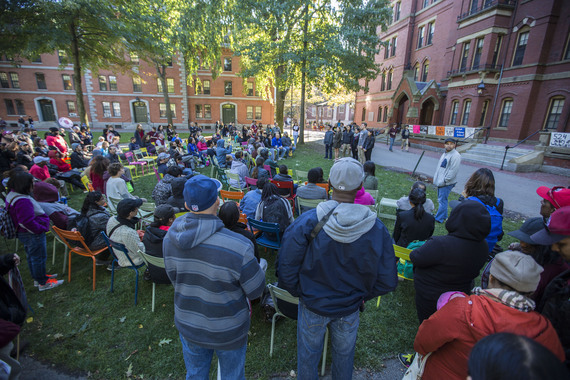 In the middle of a Monday afternoon, over 100 people gathered in Harvard Yard where the colored lawn chairs had been organized into a large semicircle. Posters hung from the porch of Matthews Hall, reading "Change the Name," "524 Years of White Lies," and "Native Strong." 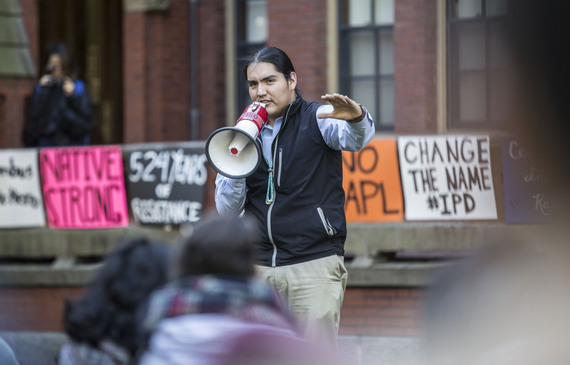 According to the University, students were out of class for the Columbus Day holiday. The supporters in the Yard, however, were celebrating a different day -- Indigenous Peoples' Day. The event, hosted by the Native Americans at Harvard College student group, featured performances and speeches celebrating Indigenous culture. Additionally, supporters were encouraged to sign a petition urging the University to celebrate Indigenous Peoples' Day as an official University holiday instead of Columbus Day. 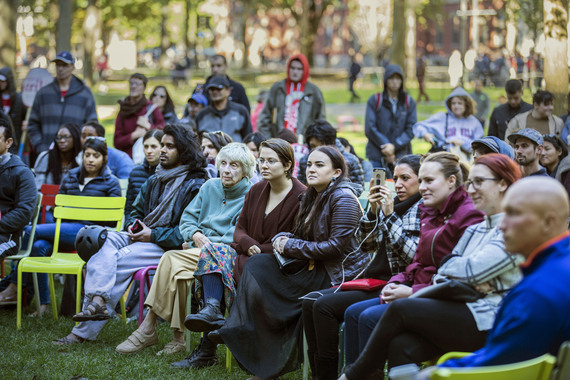 Students, supporters, and passerby gathered outside Matthews Hall in Harvard Yard for a two-hour event of music, dance, spoken word, and celebration. "I am standing up here very proudly today," said Megan Red Shirt-Shaw of the Graduate School of Education. 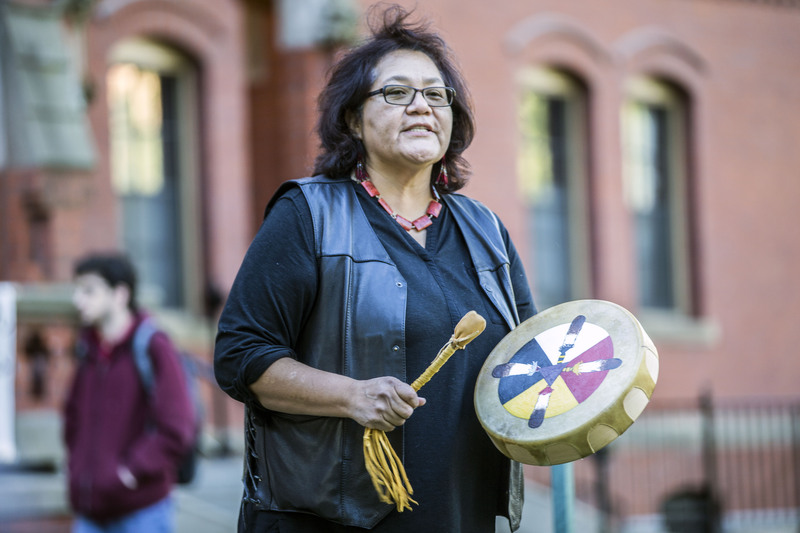 She spoke of an anecdote earlier in the day when a non-Native friend of hers ran up to her, hugged her, and excitedly wished her a happy Indigenous Peoples' Day. "So all I want to say is thank you for supporting us," she concluded. 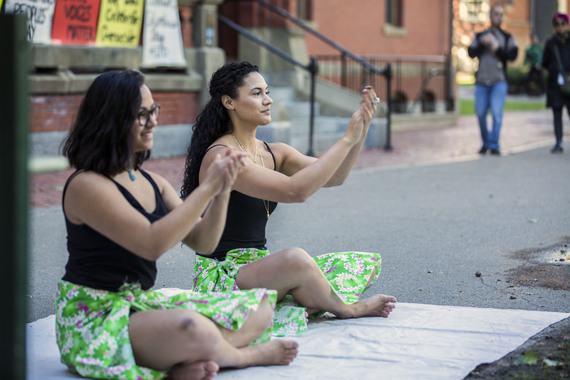 Cambridge residents Caroline Daley and Pua Higginson perform a Tahitian dance at the event. While many of the performers were students and affiliates of Harvard, others hailed from elsewhere; Daley, for example, is a student at Cambridge Rindge and Latin School. Each of the performances had traditional cultural significance. Here, a performer plays a drumming song about the four directions -- North, South, East, and West. "May we walk forward thinking about the future," she said. 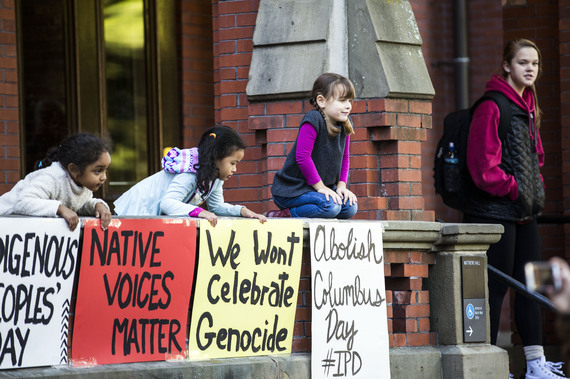 People of all ages gathered in the Yard to show their support for Indigenous Peoples' Day. Attendees of the event listen intently to the speakers. 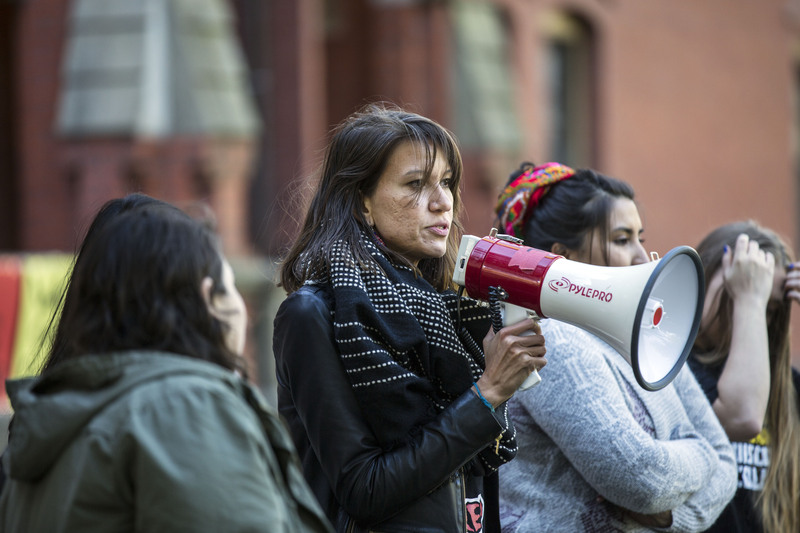 The event served not only as a celebration of Indigenous culture but also as a call to action for the University to recognize the holiday. On Monday night, the Undergraduate Council at Harvard endorsed a motion calling on Harvard to recognize Indigenous Peoples' Day. During a fifteen-minute break from performances, supporters gathered around tables to sign the petition urging the University to recognize Indigenous Peoples' Day. Harvard's Charter of 1650 outlines their mission to educate "...the English and Indian youth of this country." 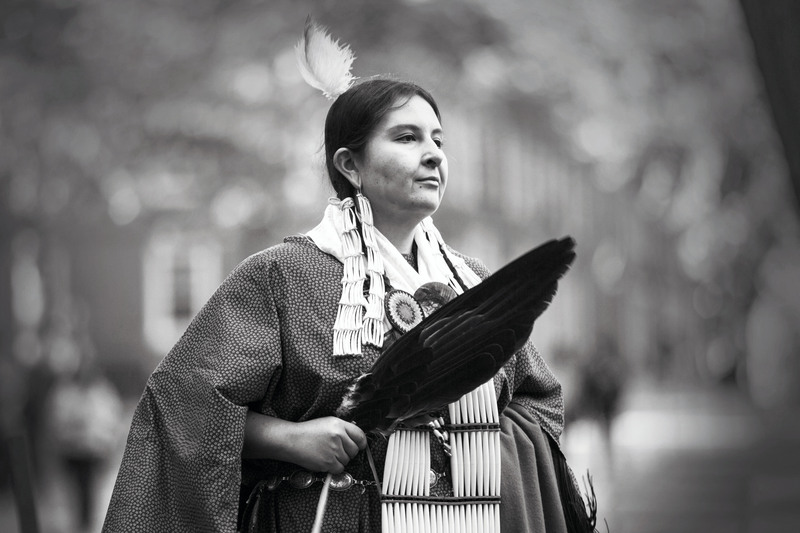 Harvard's commitment to educating Native people was at the center of the University's foundation. 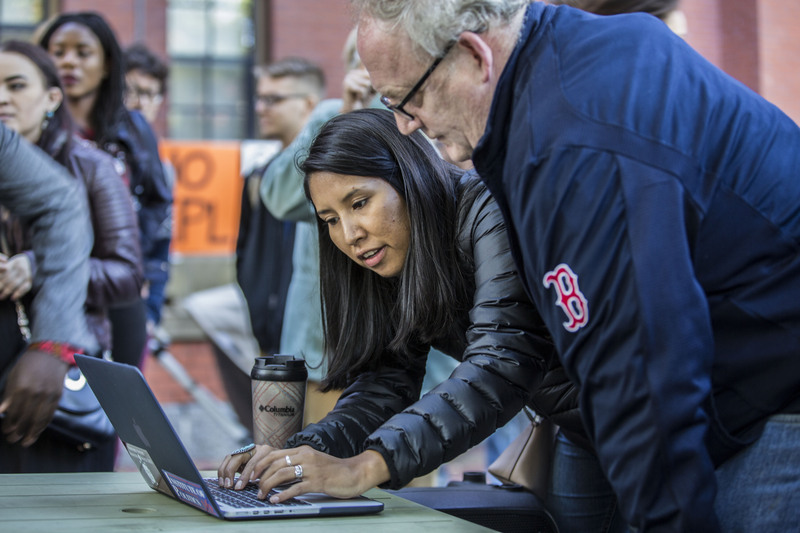 Here, supporters sign a petition encouraging the University to take the next step in encouraging and supporting Native people as their original mission reflects. Colorful posters covered the porch of Matthews Hall in Harvard Yard. 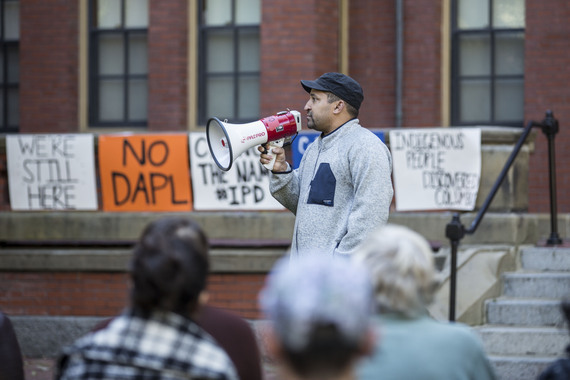 "We're Still Here," a sign read, others expressed simply "IPD" and "Recognize IPD" (Indigenous Peoples' Day), and one even read "No DAPL," in support of the Dakota Access Pipeline affecting the Standing Rock Sioux tribe. Autumn White Eyes of the Graduate School of Education spoke of a touching quote she heard during her time at Harvard, in regards to living as a proud Native person: "You are your ancestors' prayers made flesh." 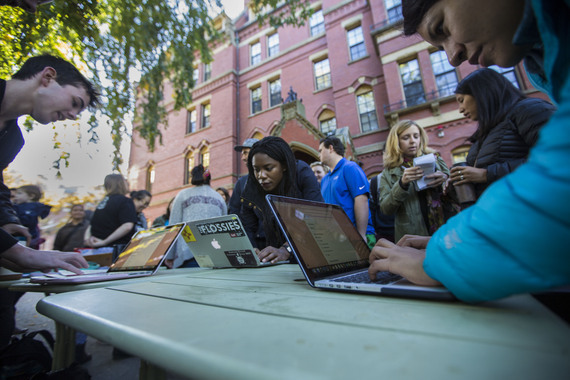 The event drew the support of Harvard University Dining Service workers, who are currently on strike in request of better wages and healthcare. 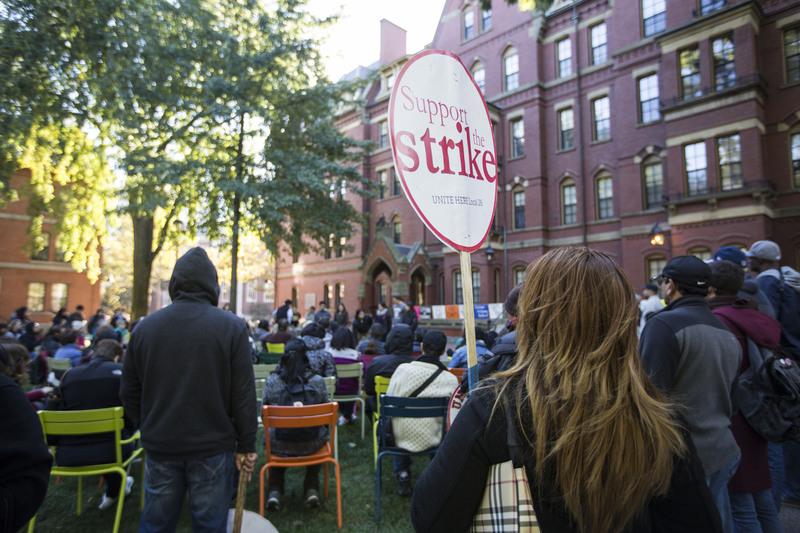 Harvard University Dining Services workers, union members, and strike supporters participated in the event; here, one worker even gave a speech during the celebration. An audience member films the event on his phone. 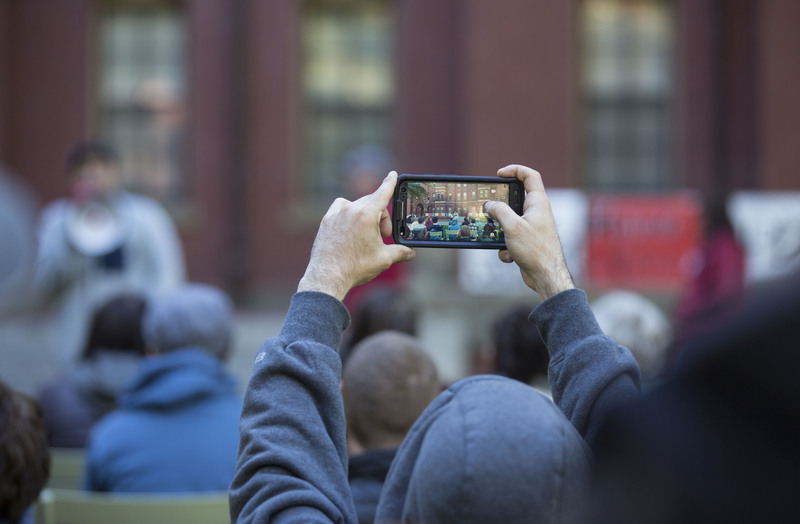 Audience members filled the semicircle of lawn chairs during the entire two-hour event, with even more people standing along the sides and in the back. 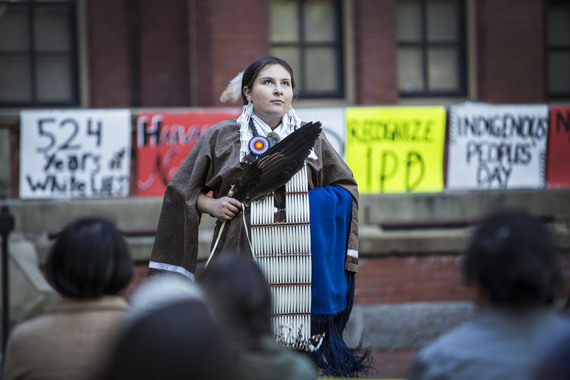 "This dance is a prayer," said Tosa Gladys Two Heart, a member of the Oglala Lakota tribe and student at Bentley University, before performing at the Indigenous Peoples' Day event Monday. She explained that the dance was traditionally performed as an offering of prayer before relatives would go hunting or into battle. 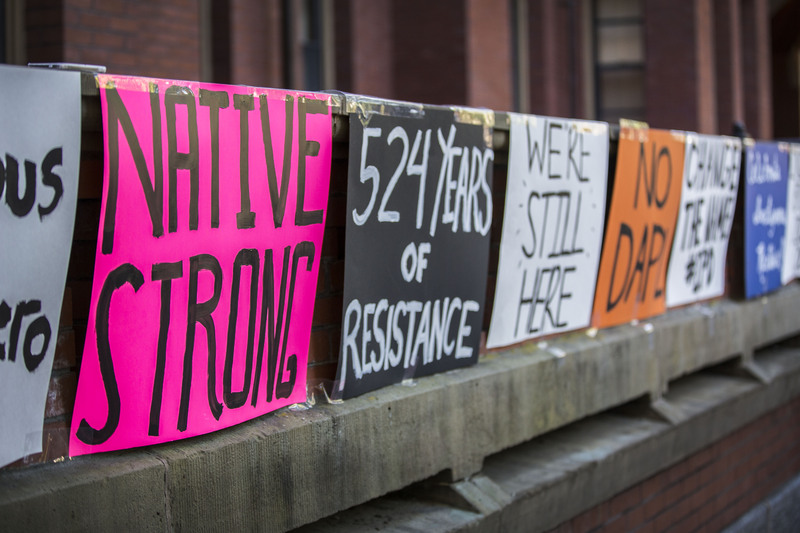 "Today it is for all those up in Standing Rock, putting their lives on the line," she said, in reference to the fight against the Dakota Access Pipeline. She said this dance was a prayer "that it will be victorious." 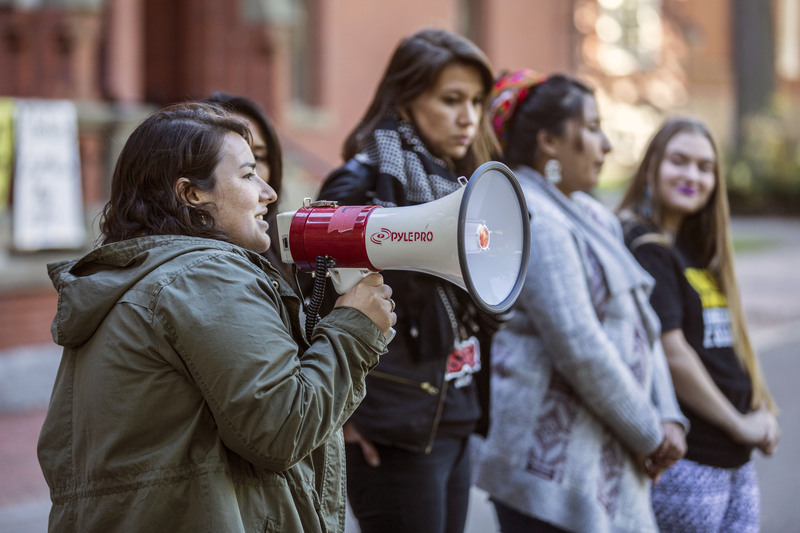 The petition calling upon Harvard to recognize Indigenous Peoples' Day as a University holiday can be found here. Follow Annie on Instagram (@AnnieSchugartPhoto) or view her portfolio at annieschugart.com.